Jaw pain and teeth grinding can cause discomfort. At Canyon Dental Centre, we provide TMD treatment and bite guards for patients experiencing these issues. TMD usually becomes an issue when a person has a poor bite, which means that the jaw doesn't align properly. This can cause TMD, which cause discomfort and even pain in the jaw joint, face, ears and teeth. If you experience any of these symptoms, you may have TMD disorder. Clenching and grinding usually occurs during sleep. This can be a very painful and damaging habit over time that can cause your teeth to wear down, break, feel more sensitive and even lead to receding gums. A common cause of teeth clenching and grinding during sleep is stress. The more stress you have, the more your body will subconsciously try to deal with it. A misaligned bite might also be the culprit for clenching and grinding. 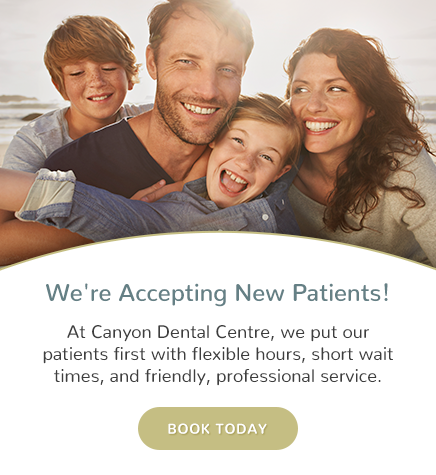 What are treatment options you provide at Canyon Dental Centre? At Canyon Dental Centre, our dentists and team members will fit you with a night guard to help reduce the impact clenching has on your teeth. This piece of plastic, which is customized to your mouth, creates a kind of buffer zone for your teeth, covering them and keeping them from coming together, causing further damage when you grind or clench. Botox Therapeutic is another treatment option and can provide dramatic relief. Injections are placed into the tender trigger points around the TMJ and results can often last 3-4 months.